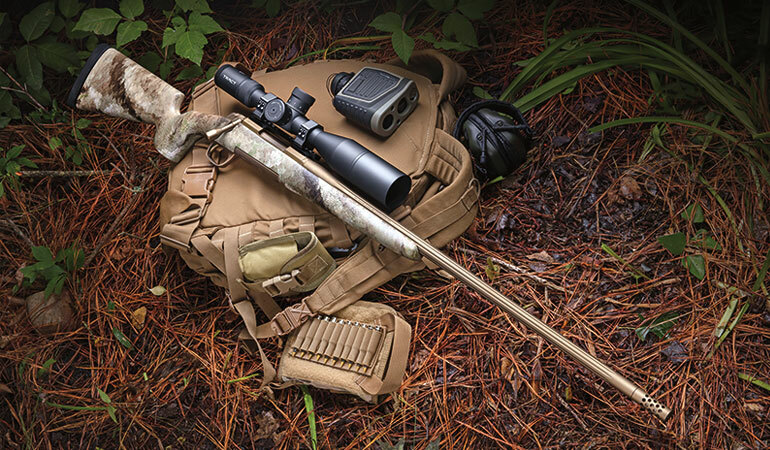 Built specifically for the aggressive wilderness hunter, Browning’s Hell’s Canyon Speed Long Range McMillan (HCSLRM, yes, that’s a mouthful) is just light enough to pack in obscenely steep, high-­altitude country, yet it possesses the accuracy needed to reach across ridgelines and perforate a big alpine buck or full-­curl bighorn. “It’s our number-­one selling long-­range rifle,” Browning’s Rafe Nielsen told me. Although not hard to see why, it surprised me because this is an expensive rifle, retailing at $2,130 chambered in standard cartridges and $2,200 for magnums. Real-­world price on dealer’s shelves trends around $1,800 to $1,900 — if you can find one; they’re popular. The brain behind the brawn is Browning’s X-­Bolt design. Over a decade ago, Browning’s R&D gurus emerged from their wizard cave with plans for an all-­new bolt action. Decreed to be lighter, smoother, stronger and more precise than anything the company currently offered, it delivered in spades. Each X-­Bolt action is precision-­turned to be slender, sleek and deadly rigid. Three locking lugs grace the forward end of the bolt, providing a short 60-­degree bolt lift for fast function and maximum scope clearance. Because they lock up tripod-­like, the lugs find a natural equilibrium — important to precise, consistent accuracy. Placed on the rear tang beneath the shooting thumb, the safety locks the bolt when engaged. Want to unload with the safety on? 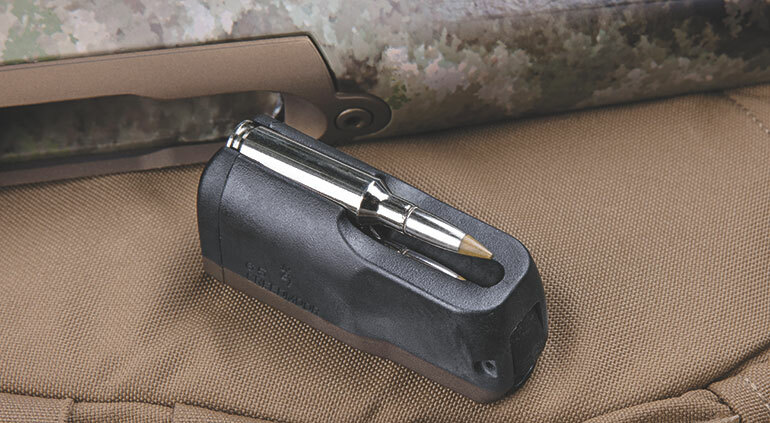 Simply press the small, square bolt-­release button atop the bolt handle to unlock and open the bolt. X-­Bolt triggers are adjustable but rarely need to be. It’s one of the best factory-­production go-­switches on the market. To adjust, simply remove the two action screws, lift off the bottom metal and turn the tension screw to increase pull weight; out to decrease. I like light triggers, so I set mine right at 2 pounds. Four screws plunge through the receiver top in an “X” shape fore and aft — eight in all — providing a very strong joint between the action and scope bases. On that note, the HCSLRM comes with an upper-­crust 20-­MOA optic rail, making mounting a precision scope easy. Barrels on all calibers in Browning’s long-range lineup stretch the tape to 26 inches, maximizing velocity potential for those long shots in gnarly winds. Chambers are hand-cut into the fluted tubes, and each barrel is carefully chambered with a target crown and threaded for a slender, effective muzzlebrake. The three-lug bolt features an oversized knob and is Cerakoted to resist the elements. Before mating with a stock, barreled actions are coated with burnt bronze Cerakote, which is an obnoxiously tough abrasion-­ and corrosion-­resistant, ceramic-­based finish. Next, each is glass bedded into a McMillan Game Scout stock, providing a perfect marriage between the two that eliminates action flex and stress — absolutely necessary to milk the full accuracy potential from the system. McMillan stocks are generally considered the world standard in tough, rigid precision stocks. Hand-laid from premium materials, they feature ergonomics born of decades of experience and the quality of old-­world craftsmanship. 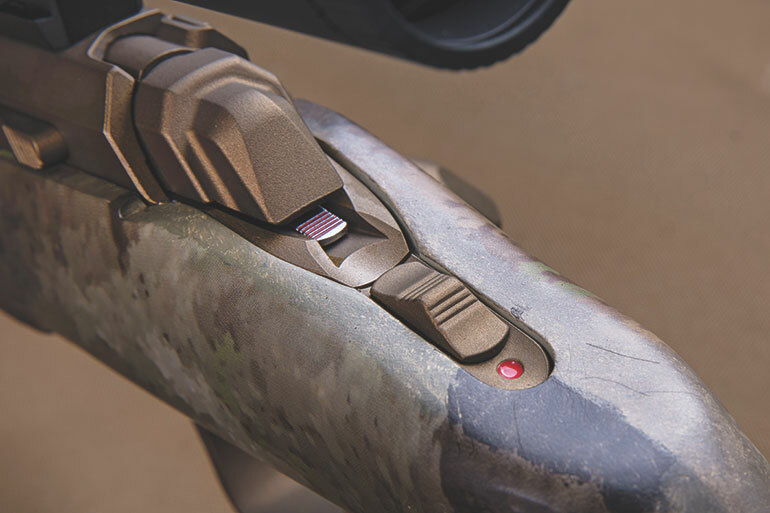 Game Scout models provide an almost-­vertical grip to benefit precision trigger control; a high comb to provide best-­in-­class cheekweld; textured panels fore and aft to provide a non-­slip grip when saturated with mud, blood or bear grease; and a super-­stiff forend impervious to bipod torque. Each stock is fit with two sling-­swivel studs and dual quick-­detach (QD) sling-­swivel cups, providing plenty of attachment points. A Pachmayr Decelerator rubber pad — arguably the world’s most effective recoil-­taming material — graces the buttstock. Browning’s understated A-­TACS AU (Arid/Urban) camo complements the burnt bronze metalwork and fades into most landscapes with surprising effectiveness. I know — I’ve been using it on clothing for years from South Texas to the Alaska Peninsula. 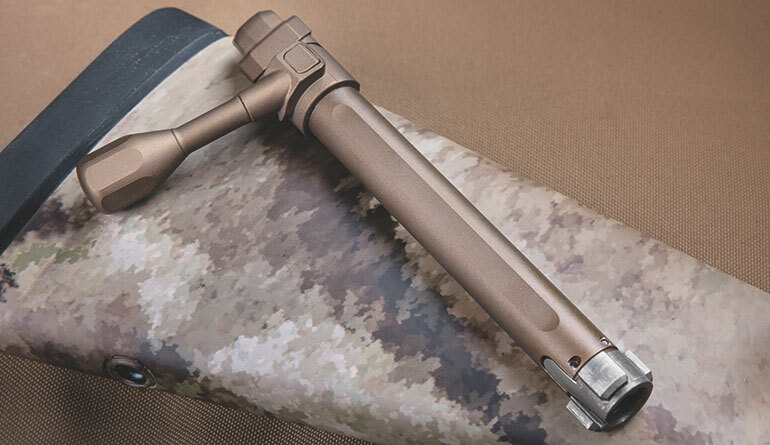 X-­Bolt barrels are free-­floated in the McMillan stock, preventing any potential contact that could adversely affect barrel harmonics and accuracy. Precision chambers are fed from rotary magazines. Made of polymer, each mag is engineered and dimensioned specifically for the cartridge it houses, and it takes recoil on the cartridge’s shoulder rather than the projectile’s nose. Yes, they’re “plastic,” but they’re made of magnificent plastic. They feed unblemished, unscratched rounds without battered noses, sliding them as if greased from a center-­fed design into the chamber. Enough with the technical jargon: How does this rifle shoot? Beautifully. That’s the short answer. I’ve never met an X-­Bolt that didn’t produce neat, tiny little groups — and I’ve fired a plethora. Before I even stacked my spanking-­new TRACT Toric precision scope on the Hell’s Canyon Speed Long Range McMillan (whew!) I knew the rifle was going to be more of an instrument than a tool. Not only is the X-­Bolt HCSLRM exceptionally accurate, it’s ergonomically designed to enable the shooter to get the best performance from field positions. Benchresting the HCSLRM, I finessed the trigger like a fine cello (its bark is much too deep to be a violin), and I sent group after group downrange. Like all rifles, it prefers some loads to others. The bullets it liked clustered on my 100-­yard target like amorous flies. Hornady’s super-­aerodynamic 143-­grain ELD-­X load (probably the best all-­around 6.5 Creedmoor hunting bullet available) averaged right at a half MOA. This specific model is available in popular long-­range cartridges from the 6mm Creedmoor to the .300 Win. Mag. My test sample is in 6.5 Creedmoor. Not only is it Browning’s top-­selling cartridge in this top-­selling model, it’s easy on my shoulder. All of Browning’s long-­range line feature fast-­twist rifling optimal for stabilizing long super-­aerodynamic, high-­BC bullets. It’s worth pointing out that this is not a tactical or competitive precision rifle. It’s not just for plinking or for pounding steel, although it does both splendidly. 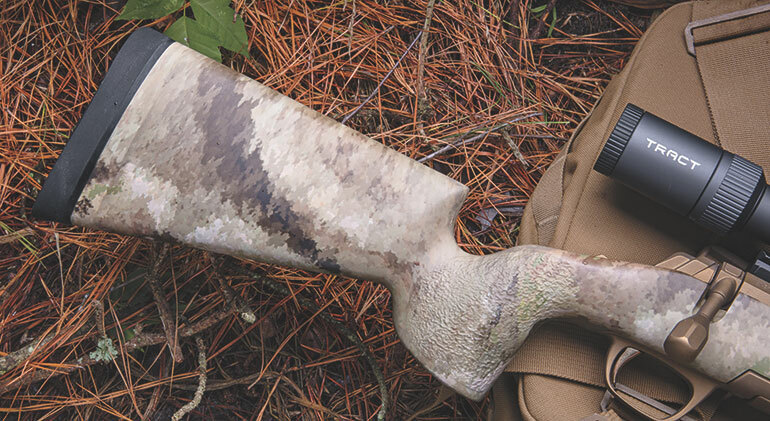 This rifle is meant for the real world — as in it’s an incredibly effective tool for drawing blood and making meat in God’s own backcountry. 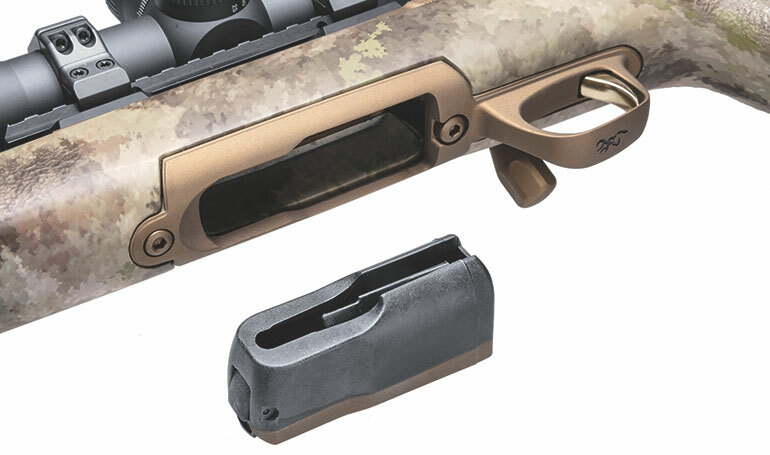 Browning utilizes a 4-round rotary magazine to feed the X-Bolt HCSLRM. The magazine feeds reliably, sits flush in the stock and won’t snag in brush while afield. As a result, it does not have a high-­capacity magazine (although faint whispers suggest that an X-­Bolt model suitable for Precision Rifle Series competitions is currently brewing in the R&D wizard’s cauldron). But this rifle’s magazine bestows light weight rather than high capacity. Of the several cartridges the HCSLRM is chambered for, I find the 6.5 Creedmoor tested here and the 28 Nosler most interesting. The 28 Nosler is a niche cartridge and is currently habanero-­hot amongst long-­range hunters. For good reason: It’s probably the single most effective far-­killing, practical cartridge available; it’s inherently accurate and offers extreme-­BC projectiles at eyebrow-­raising velocities, which translates into wind-­bucking, hard-­hitting ballistics. Accuracy is the average of three, three-­shot groups fired from a Spartan bipod front and sandbag rear rest. Velocity is derived from a string of 6 shots measured by a Labradar chronograph adjacent to the muzzle. You won’t find this rifle in the sporting section at the local big-­box store, and you can’t buy it cheap. This level of performance always commands a premium — and well it should. 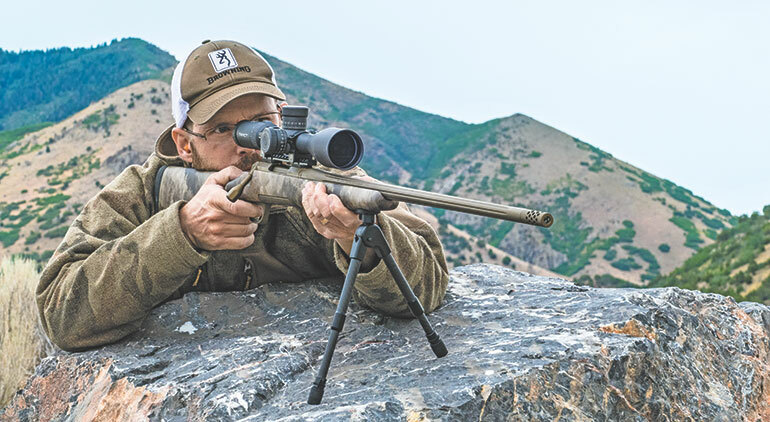 Browning’s X-­Bolt Hell’s Canyon Speed Long Range McMillan delivers custom-­rifle performance at a production-­rifle price. Magazine: Polymer, rotary, 4 rds.